The Vancouver Aquarium is Canada’s largest aquarium and one of the most visited sites in Stanley Park. It is home to more than 70,000 creatures including dolphins, sea otters, anacondas, three-toed sloths, eels and more. 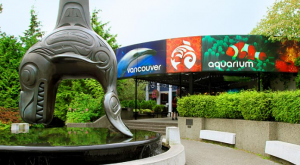 The Vancouver Aquarium is widely respected for its research and marine stewardship, and visitors can learn more about the region’s marine life through the numerous exhibits. Adults and kids alike will love the entertaining and educational “encounters” program, which allows visitors to go behind the scenes and get up close and personal with the animals and the people who train them. This includes feeding, helping train and learning about the habitats and lifestyles of dolphins, sea lions, sea otters, sea turtles and other sea creatures. The permanent marine animal displays are as diverse as the ocean itself. In the Amazon gallery, creatures slither, swim and splash around. Another features 22 species of frogs, toads and salamanders in the Frogs Forever? exhibit, which talks about the extinction facing many of the amphibian species. There are also exhibits focusing on butterflies, Artic creatures, tropical waters, dolphins, otters, seals, the British Columbia coast and more. The aquarium focuses heavily on species native to the Pacific Northwest. Yup, if it swims or lives in an ocean, lake, river or stream, there’s a good chance the Vancouver Aquarium has an informative display around it. Throughout the year, the marine life housed in the Aquarium comes to life in the form of entertaining and educational shows that include the popular dolphin demonstrations, feedings, reef shark performances, and talks that focus on habitats, conservation and more. 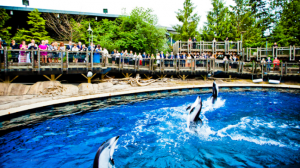 The various shows are generally scheduled every 45 minutes, and the aquarium also features special events regularly. Planning to come to Canada to study English? Come to Vancouver and study at EC Vancouver English Centre!